If you are someone who have little or no experience in agile and other related ways of working, you should start considering learning about it now. 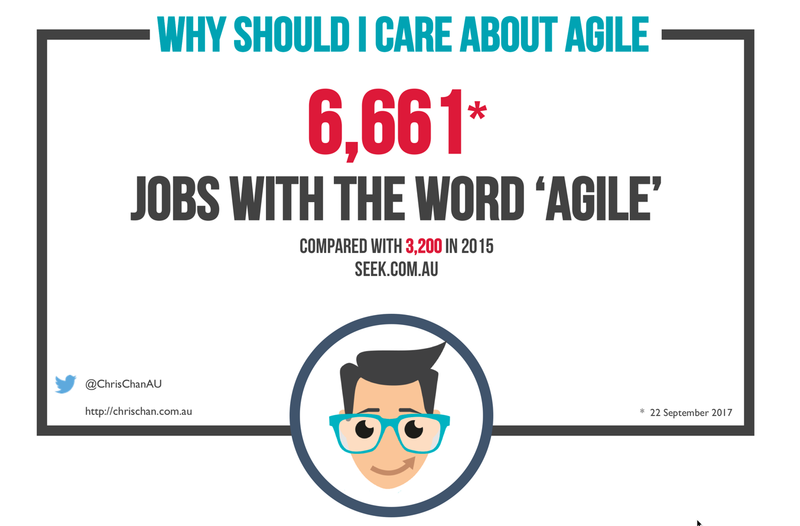 A recent search at one of the largest job search sites in Australia, seek.com.au, reveals 6,661 jobs with the word ‘agile’. This has more than doubled in 2 years! This number fluctuates over time based on the economy and job market, but there is no undeniable fact that the demand is growing. Agile has crossed the chasm with the early majority having embraced agile. Based on my own experience, network of peers, interactions at meetups and conferences and data from numerous yearly surveys (Forrester, Gartner, VersionOne State of Agile etc), many mainstream companies exhibit some form of agility. What this looks like at each organisation is different and depends on the company’s culture, goals and strategies. And agile thinking is also permeating into our everyday lives. Some might have thought agile will be a fad, be short-lived, and if you wait long enough it will wash over. Ten years ago there were many naysayers. Today its becoming a necessity. Yes, history has shown that the world will change and evolve and that one day agile will be a distant past. However, as long as change continues to accelerate only the agile company can survive. This means you will need agile skills as jobs are demanding it. Whilst agile is here to stay, we all need to embrace it otherwise you may be left behind. What is the relationship between Systems Thinking, Lean and Agile? The Improvement Paradox - Too Busy To Improve? All work in this blog - including both text and images (except those attributed to others) - is licensed under a Creative Commons Attribution-ShareAlike 4.0 International License. For use, please attribute to Chris Chan and provide a link to this blog: http://chrischan.com.au.